An unused formal living room was converted into a functional office for the lady of the house, who is an accomplished and self-employed equestrian. Our goal was to add character, personality and function to the office, while at the same time displaying all of the equestrian accessories and wall art she had accumulated over the decades. Initially, our clients were worried about the “beige” walls, which really just served as the canvas for her vast collection of decorative items. By displaying so many of her treasures on the walls, not only could she better enjoy them, but it also minimized clutter everywhere else. A few dashes of purple (a favorite color), such as an accent chair and the trim around the windows, break up the neutrals and browns. A bedroom, which used to serve as the office but was no longer functional and had essentially become a "closet" full of paperwork, collectibles, etc., was now freed up to become a beautiful guest room along with a remodeled hall bath. Before - The formal living room served as a combination storage space and exercise room. After - An unused living room converted into a functional and very personal office space. Can you guess this office belongs to a licensed Parelli Professional? (Parelli is natural horsemanship training system). Before - The original office in one of the bedrooms. Not a true before shot as we had already started to move items in preparation for the design project. Before - You can't have a beautiful guest bedroom without an equally beautiful bathroom! After - Oh yes! This is the same bedroom. New paint and trim, a different fan, a custom bed, bedding, furnishings and accessories welcome guests to this country home. After - And voila! There was even enough space to incorporate a second sink. After - One of our favorite design elements in this bathroom? The "parquet wood flooring," which in reality is a porcelain tile. Although you would never know it unless you physically touched it. 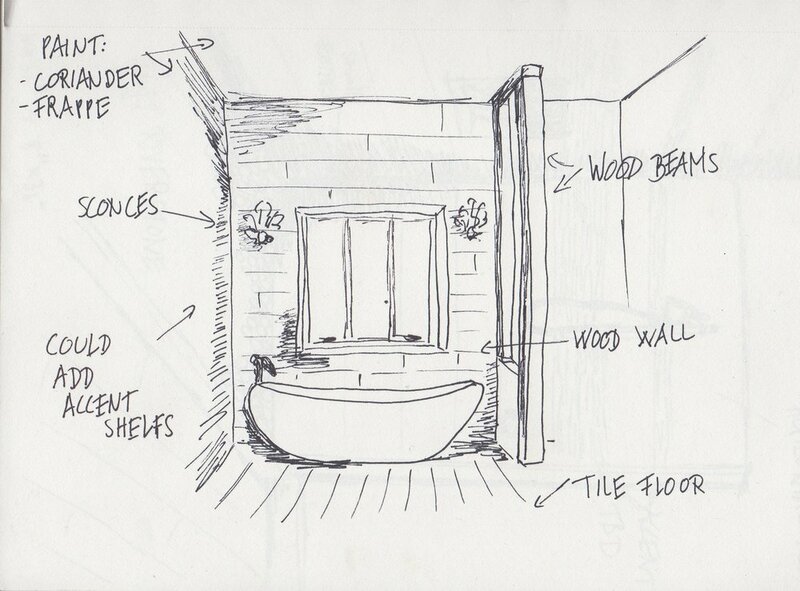 Beautiful and practical at the same time and the perfect starting point for this bathroom design. After - The framed photographs, sourced from Arizona, are a nod to our client's love of horses and riding. After almost 30 years, our clients decided it was finally time to update the master bath in the house they had purchased as newlyweds. Their tiny bathroom was typical for a two-story colonial from its time period and consisted of a cramped shower, single small vanity and toilet. It was totally gutted and transformed. The inspiration - Our clients fell in love with this beautiful tub from the Boutique Collection by MTI Baths. Although a tad too big for the space, we made it work! After - Modern tiles are mixed with reclaimed wood to add texture and the perfect backdrop for the gorgeous tub. We also incorporated a black ceiling, small accents of purple and turquoise (our clients' favorite colors) and a little bling aka the mini chandelier. After - Flat river rock was chosen for the flooring in the shower to keep the look clean and organic. A custom bench seat on an angle takes advantage of every inch of space we had. After - A separate rain shower and hand-held shower provide maximum enjoyment and functionality. After - A custom barn door adds a rustic touch and maximizes the floor space. Based on our style analysis, it was evident that creating a sophisticated space for him and her would require just a little compromise. Both loved red and green, the comfort of their existing sofas and their artwork. However, he leaned toward a traditional style and preferred symmetry and very dark wood tones, while a more transitional and eclectic approach resonated with her. Once we started the discovery process, both surprised us with their excitement and willingness to step outside of their comfort zones and explore other options. Who would have anticipated that the final design would include a large birdcage in the living room, zebra print fabric covering a repurposed coffee table in the family room, a wolf head as part of the gallery wall and a heavily distressed console that is in stark contrast to his very traditional taste? To achieve their newly blended aesthetic, eclectic elements from different eras and styles were combined. Colors and textures were carefully balanced. For sustainability reasons and to maximize their budget, we carefully reused and repurposed existing belongings. This not only worked well with the overall vision, but also ensured their beloved treasures were integrated into the design. Each element was thoughtfully considered, which minimized unnecessary clutter and allowed for a cohesive, clean appearance. This approach infused elegance, comfort and a timeless appeal into the design of their new home to reflect their tastes. By preserving items from the past and shaking things up with new pieces, we were able to clearly capture both of their personalities. We discovered an antique chair in the clients' basement, which was slated to be discarded. Instead, we rescued and reupholstered it. The chair is now a stunning conversation piece in their new living space. Before its makeover, the fireplace had no personality and was, quite frankly, boring. We created a (pretend) chimney wall, replaced the tile and added a lot of architectural trim and details for a little drama and interest. Our clients' favorite color red was incorporated in small accents throughout the open living space, such as the edge banding we added to the drapes in the kitchen dining area. A gold damask stencil provides the final touch in the dining area. Our clients' extensive art collection and treasured antiques mixed with a new distressed media cabinet and Sophie the family dog. What's not to love?! Before - Her father's old chair had a a lot of sentimental value but definitely didn't fit into this couple's modern house. After - We re-upholstered the chair in black leather and changed the wood finish to black. The pillow? 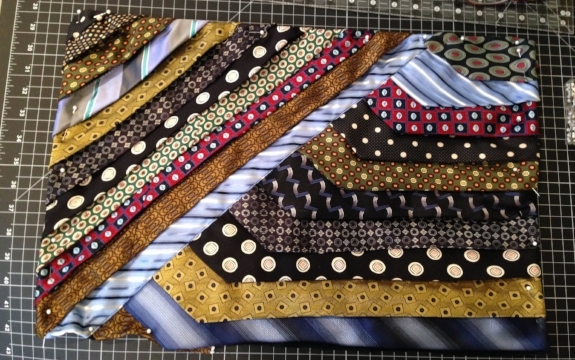 Well, the husband loves ties and had been nicknamed "Mr. Tie-Man" by his friends. Since the new chair was now his, we just had to ask him for a bag of old ties. Left - This pillow was custom designed and hand-sewn by Iris leveraging her former quilting skills that she no longer has time for. Each tie weaves in a story for our client, leading to a lot of happy memories encapsulated in a single pillow. The best part? We don't charge extra for these one-of-a-kind details. Before - Once our clients moved into their new construction home, they realized they'd made a mistake with these pendants. They had seen pendants they LOVED in a restaurant on a trip to Florida but it just seemed impossible to make that wish a reality. After - Ok, we can't lie. It took many, many hours to bring our clients' dream pendants to fruition. The verdict? Even better than the inspiration! Below - After a lot(!) of research we found the right starting point. Not meat hooks, not ice block tongs (a temporary idea), but logging tongs. Custom creation - Access to the right craftsmen allows our visions and designs to come to life! Our clients were in love. Their new pendants are unique (see after photo above), remind them of their trip to Florida and are a conversation piece when they entertain. Before: A dated color scheme and finishes made this powder room unappealing to guests. The lady of the house wanted something unique but traditional. Red is her favorite color! Inspiration: We found this stunning red drawer chest and knew it would be the perfect piece for the new powder room, seamlessly blending form and function. After a quick text to our contractor to confirm it could be converted into a vanity, we ordered it! Details: We found this gorgeous antique brass and glass tray in one of our favorite antique shops. More details: We had these custom fingertip towels made by one of our artisans. A close up of the beautifully appointed vanity top. The fresh flowers add another pop of red to the room. After: The converted chest and the simple black granite are the perfect pairing. The gold, hand-painted scroll work complements the ornate mirror while beautifully balancing the toile wallpaper. The chic accessories round out the design. No detail is overlooked! Salvaged doors - A desk area was created in a large family room with 20 plus foot ceilings, by installing antique oversized doors. Old buildings often have great original floors and this building was no exception. Underneath the carpeting, we found a black and white marble floor that needed major TLC but had lots of potential. After some serious work, the dramatic floor was restored and became a great starting point for the lobby’s redesign. The project also included the creation of a new cheerful mailroom that picks up the accent colors from the lobby and is accessorized with pieces that pay homage to the building’s river location. In selecting furniture, the goal was to make the lobby look residential although we used durable, commercial finishes. In accordance with the client's wishes, the furniture plan is aesthetically pleasing but, in reality, it's socially awkward in order to prevent the lobby from becoming a place to hang-out. There is minimal seating and the bench by the front entrance has no back — good for waiting for a ride but not for lingering. After - The building's age and location near historic Philadelphia called for vintage pieces, such as these custom French bergère chairs. The original mirrored columns were retained as a security feature. The walls are covered in Xorel, a commercial wallcovering that is washable, bleach-able and has some reflectiveness, which adds to the airiness of the space. After - The floors were restored (see the photo below), the brass trim was painted black and new custom covers were ordered for the baseboard heating. Because the building has a no-pet policy, the dog sculpture has become a bit of a mascot. One occasionally finds residents petting it! Before - The lobby looked dated and dark. Before - The hidden treasure-black and white marble flooring was found under the dated carpet. After - A beautiful chaise and building-friendly dog. Left - View of the same area before the redesign. After - In the elevator area, we recycled the large mirror, added reclaimed wood for interest and texture and installed beautiful sconces for aesthetic and functional reasons. The textured vinyl bench cushion is both beautiful and durable. .
After - The mailroom is a new addition to the building's first floor. After - Accessories and artwork reflect the building's location by a river.